Merry Christmas and Happy Holidays! I hope you are enjoying this time to relax as much as I am. Now that I’m done with yoga teacher training on the weekends, I am excited to be back on the blog sharing recipes with you! I am also excited to spending my Sundays meal prepping for the week. For the past couple of months I’ve definitely been “winging it” with my meals, which is not my style whatsoever! 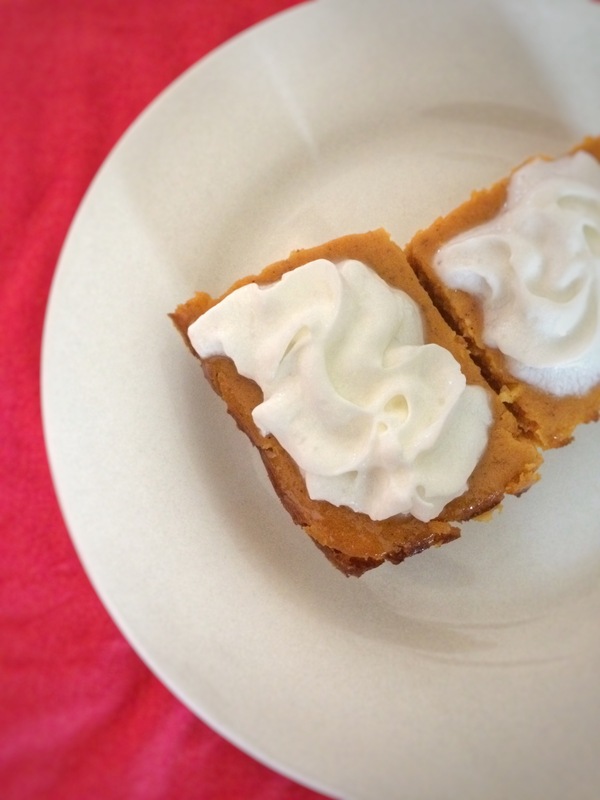 I have a short but sweet (literally) recipe to share today. I make this so often, I cannot even count how many times I’ve made it this fall season alone. I was not planning on posting this recipe, but I shared it with a friend, who shared it with her family…and well, if it is already being shared, I may as well share it with you! Grease a square baking pan. Pour batter into the pan. Bake for 40 minutes. Allow to cool thoroughly before eating – perhaps even in the fridge overnight! It tastes exponentially better. 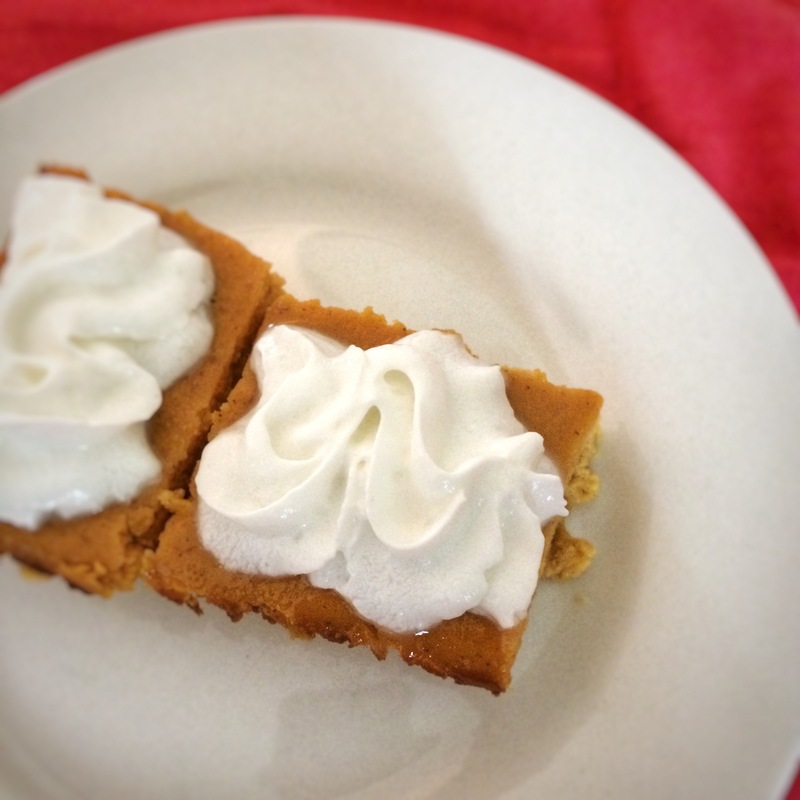 Serve with cool whip or whipped cream. Hi friends! Can you believe it’s already December? I really can’t tell you where 2016 went, especially the last couple of months, since I have been engrossed in yoga teacher training. Sadly, there are only two weekends left of the training – just in time for the holidays. One of the best parts about yoga teacher training is the friends I have made. And funnily enough, one of the main topics of discussion amongst the group is food. Since we do a lot of yoga, we exchange healthy recipes and new snacks to supplement it! Today, I was telling a few of my friends about kichidi. 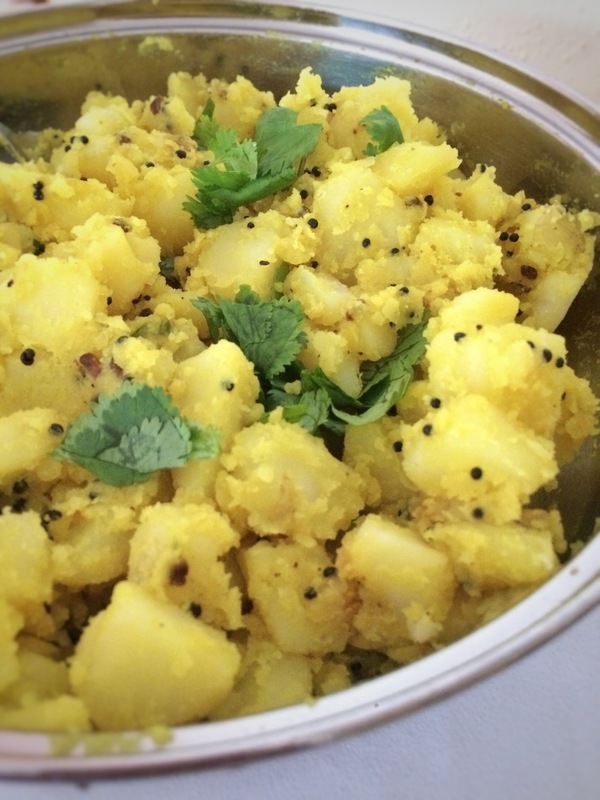 It is a common Indian dish that is also well known in the world of Ayurveda and Ayurvedic medicine. It is literally my go-to recipe for the weeks I don’t feel like being creative in the kitchen. It is the easiest, healthiest one-pot meal and my favorite bonus is that it is easily digestible. 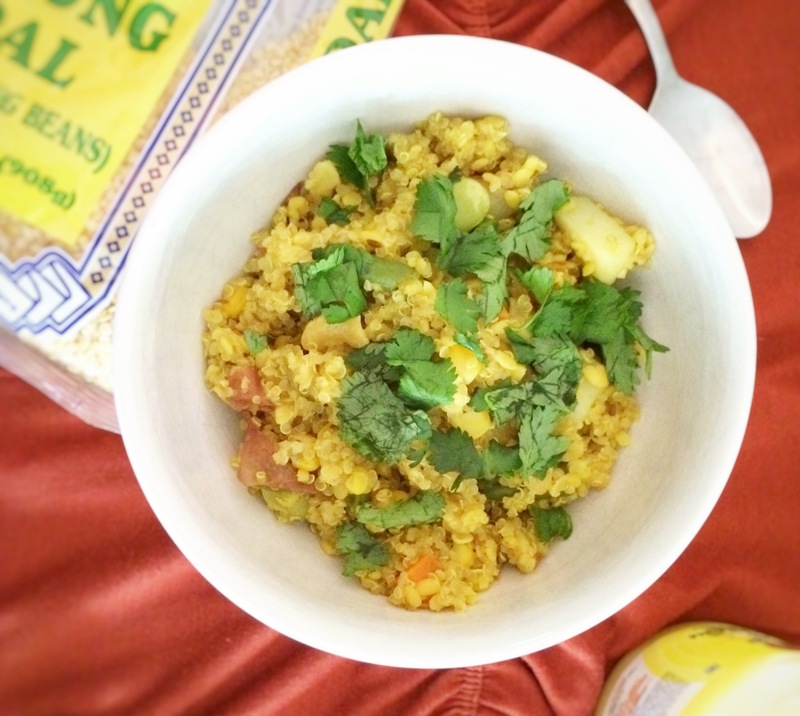 (Really – doing yoga all weekend calls for easily digestible meals!). Note: I used quinoa in this particular recipe, but you can substitute the quinoa for brown rice as well. Typical kichidi is made with white rice. Turn the stove on to medium heat. In a large pot, heat the clarified butter. Add the cumin seeds, chopped ginger, chopped garlic, asafoetida, and curry leaves. Allow the spices to heat up until fragrant. Add the cashews and fry for another minute. Add the quinoa, moong dal, and 4 cups of water. Then add the turmeric, black pepper, and veggies. Cover the pot and allow the kichidi to cook until all of the water is absorbed. Garnish with chopped cilantro. Enjoy on its own, or with a side of yogurt or raita. Hi friends! Hope the weekend has treated you well. Today marks the halfway point of my yoga teacher training. This is exciting but also a bit unbelievable considering I feel I have so much left to learn! Because the weekends are nonstop with the training, I literally throw together random combinations of brown rice and vegetables for lunches and dinners. I’ve also become re-obsessed with cereal (of the gluten-free variety). Hence why I have not been showing off my foodie creations as of late. Luckily, I had this particular recipe stashed away for a rainy day! 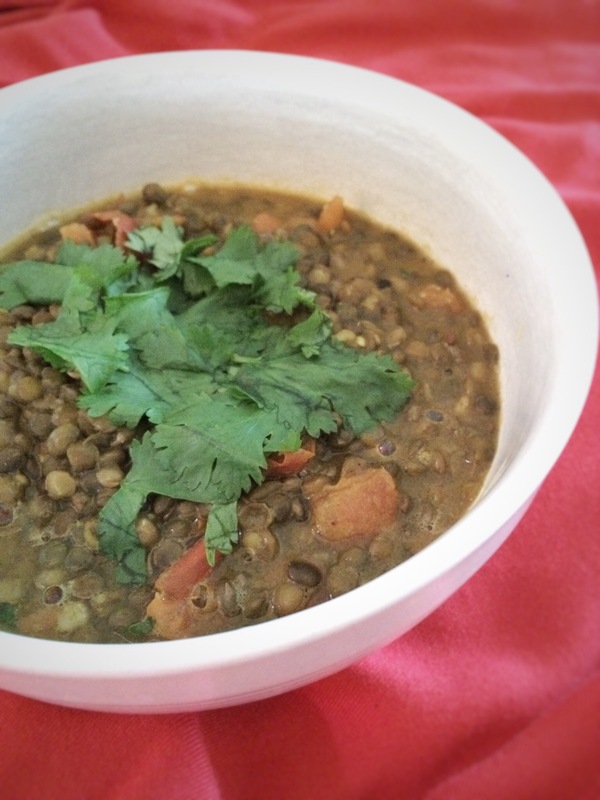 The funny thing is, when I made it, I was throwing together random ingredients with no plan in mind, and it turned out *almost* like the dal I was used to eating at home. So I call that successful. Place a large pot on the stove, and turn on the heat to medium-high. Melt the ghee and add the cumin seeds. Once the cumin seeds become fragrant (about 1 minute) add the chopped tomatoes. After another minute of stirring the tomatoes, add all remaining ingredients except for the cilantro. 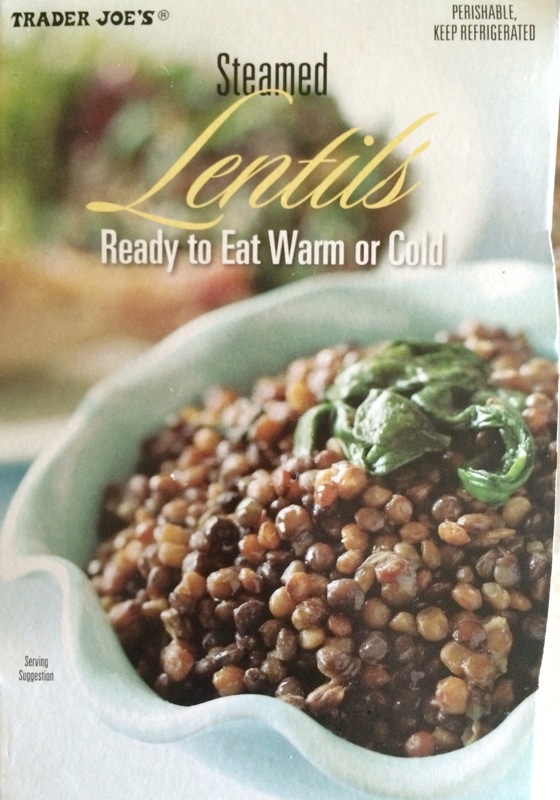 Mix all ingredients and allow the lentils to simmer for 8-10 minutes. Remove from heat and garnish with cilantro before serving. *Note: a small amount of water can be added if a soup-like dish is desired. This dish can be paired with brown rice, quinoa, a whole wheat tortilla, or enjoyed on its own! Happy Halloween eve, Karma Eats friends! It has not felt like Halloween weekend at all – there were two days of what felt like fall last weekend, and now we are back to the usual heat and humidity. Also, since I am in yoga teacher training for the next couple of months and have no social life during these weekends, I was having a little FOMO when I saw everyone’s Halloween costumes from various Halloween parties this weekend! The good news is, I’ll be dressing up for our work Halloween costume contest tomorrow…pictures to follow (probably on Instagram – @karmaeats). Because my weekends are now booked with the training, I’ve been relying on my quick one-pot meals more than ever. This is one that I made recently, and a couple of coworkers asked for the recipe as I was heating it up for lunch! I was almost embarrassed to share the recipe with them and I certainly was not planning on posting it since it is THAT simple. But since the recipe was in demand, I thought, why not? 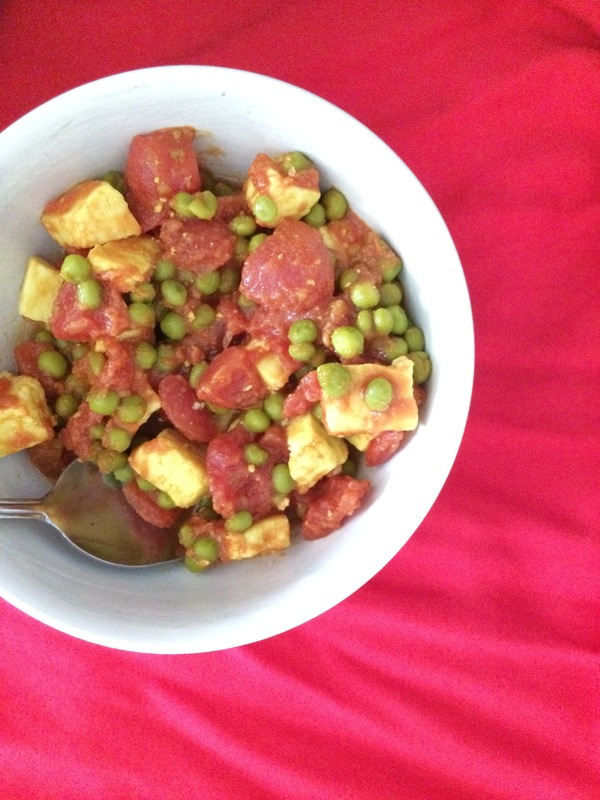 Note: This recipe is completely my own random creation and may or may not be similar to a typical paneer matar recipe. Melt the butter in a large pot over medium-high heat. Add the garlic and ginger and saute for a minute. 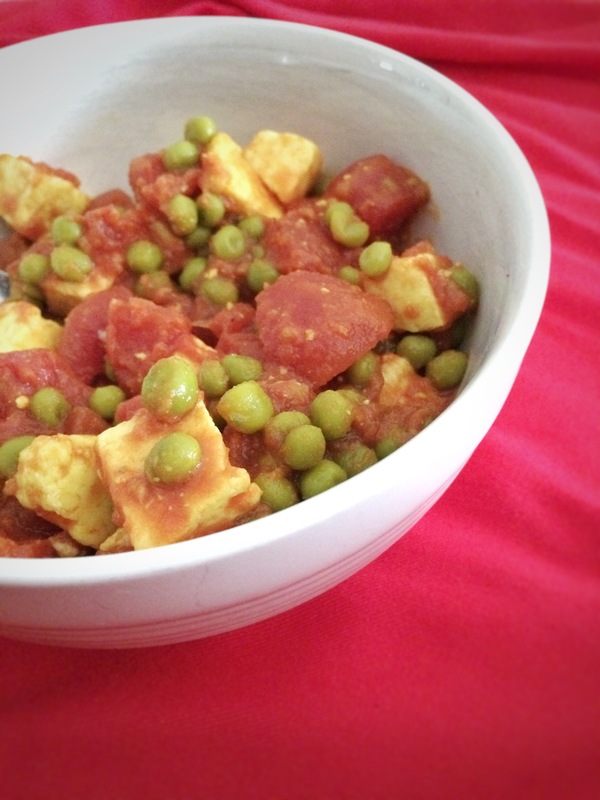 Add the tomatoes, peas, and paneer. Season with the remaining spices and allow the mixture to boil for 3-5 minutes. Stir frequently. Serve with rice. Hi everyone! I’ve had a very eventful weekend (but really…when are my weekends uneventful?!). I made a quick trip to sunny Phoenix and had the chance to catch up with all kinds of friends. Shoutout to those who told me they read Karma Eats! The topic of why this website started in the first place came up quite a bit, and actually has come up frequently in the past month. Stay tuned – the story will follow in a post soon! While Karma Eats focuses on Indian food, every now and then I’ll be posting some different recipes for a change of pace. Today is one of those days! 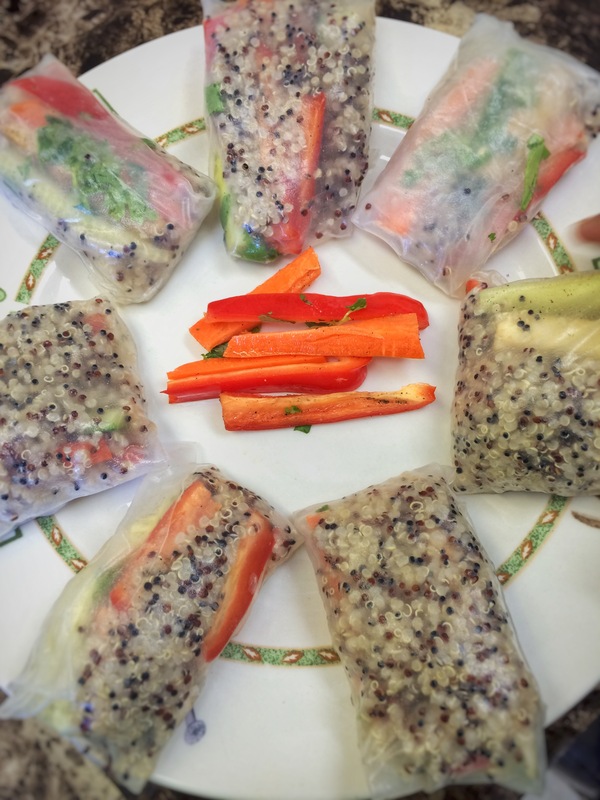 This weekend, we made a fancy lunch which included these rice paper rolls. While it seems complicated, it is actually really simple – hardly any cooking involved!- and healthy. Lots of veggies and a 100% vegan dish! *Baked tofu: slice tofu, place it on a baking sheet, drizzle olive oil and soy sauce (or gluten-free tamari), and bake at 350 degrees for 10 minutes. Remove from the oven, flip each piece, and bake for another 5-8 minutes. To prepare the veggies, place all sliced veggies into a bowl, along with the cilantro. Squeeze the lemon juice into the bowl and add the black pepper. Mix and set aside. To prepare the rice paper, place two plates side by side. Fill one plate with water. Place one rice paper sheet into the water and allow it to absorb water for approximately 1 minute – at that point, the rice paper should become pliable. Transfer the rice paper sheet onto the dry plate. Place 2-3 spoonfuls of quinoa onto the rice paper, close to the top quarter of the sheet. Place two slices of tofu, and one or two slices of each of the veggies, with cilantro, on top or next to the quinoa. Make sure you don’t over fill! Fold the ends of the rice paper in, and begin to roll until the complete roll has formed. Set aside and repeat with desired number of rice paper sheets. To make the dipping sauce: combine all ingredients in a bowl and mix well. The sauce should have the texture of a thin paste. I have so much to share with you, but I am typing this in the airport, landed hours after I was supposed to arrive…isn’t travel the best?! 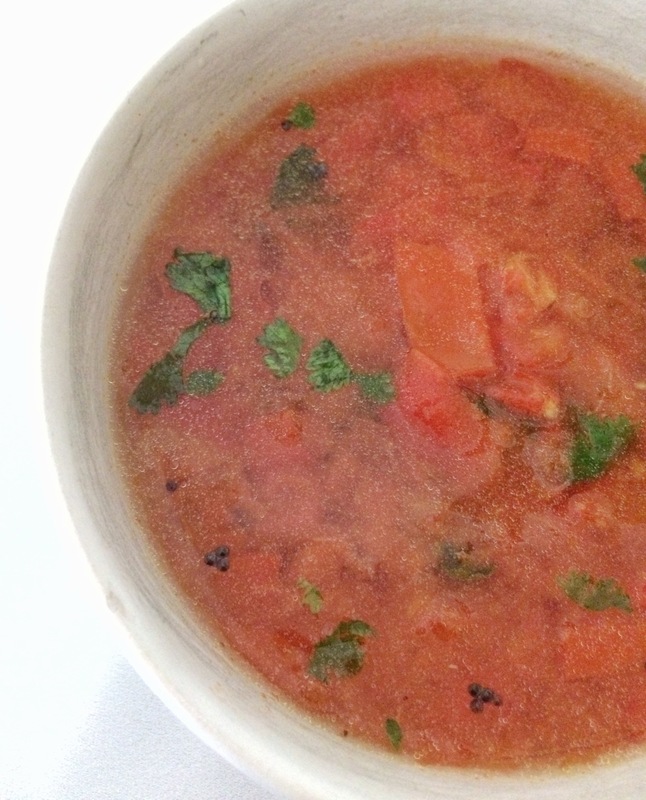 So this recipe today is one that I made last week that I happily ate with my rasam and rice for lunch! It’s basically Indian-style mashed potatoes. What’s there not to love? In a large pot, place the potatoes and enough water to cover them completely. Boil on high until the potatoes are soft. Remove the potatoes, and allow them to cool slightly before peeling and cutting them into cubes. In a large skillet, melt the clarified butter over medium-high heat. Add the mustard seeds, urad dal, and asafoetida. When the seeds begin to pop, add the ginger and green chilies, along with the potatoes. Mix well – I even mashed some of the potatoes. Add the turmeric, salt, pepper, and cumin. Mix and/or mash again. Remove from the heat and squeeze the lemon juice onto the potatoes. Garnish with cilantro and serve! Today is an important day. I finally made my most favorite food in the entire world. And I am going to share it with you! Like some of you, I tend to find cooking Indian food daunting. This is one of those foods that I’ve never attempted to make because I thought 1) it was too hard and 2) it wouldn’t come out like my mom’s! 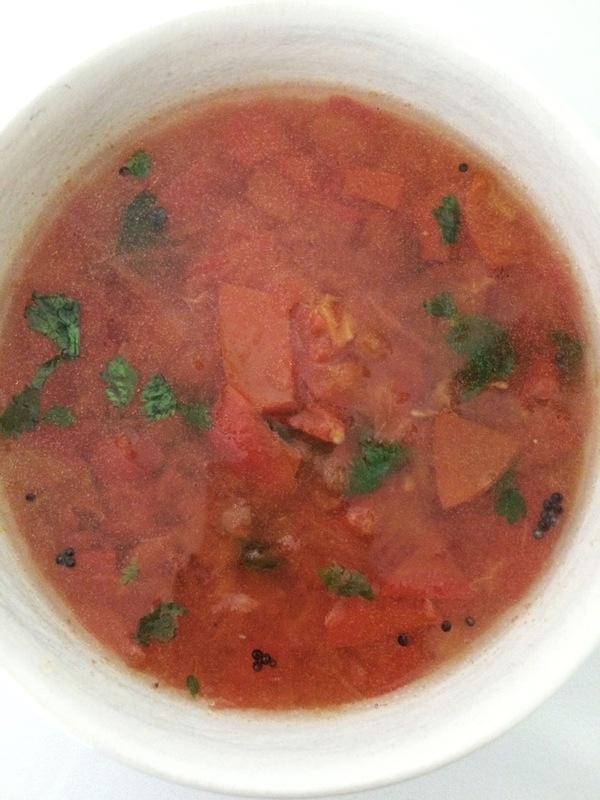 So what made me decide to make rasam today? I was talking with Katherine at Deliberate Fare and she inspired me to make an Indian dish with no onion, no garlic, and no dairy to allow for intolerances to these ingredients. And so I made it happen with this well known Indian comfort food. I used this recipe as a base and tweaked it slightly. In a large pot, place the tomatoes (chopped or not – I chopped them) and water and boil. When the mixture starts to froth add the pepper, ground cumin, turmeric, and salt. Continue boiling for another 5 minutes. Then using a potato masher, mash the tomatoes. The mixture will not become completely homogenous. 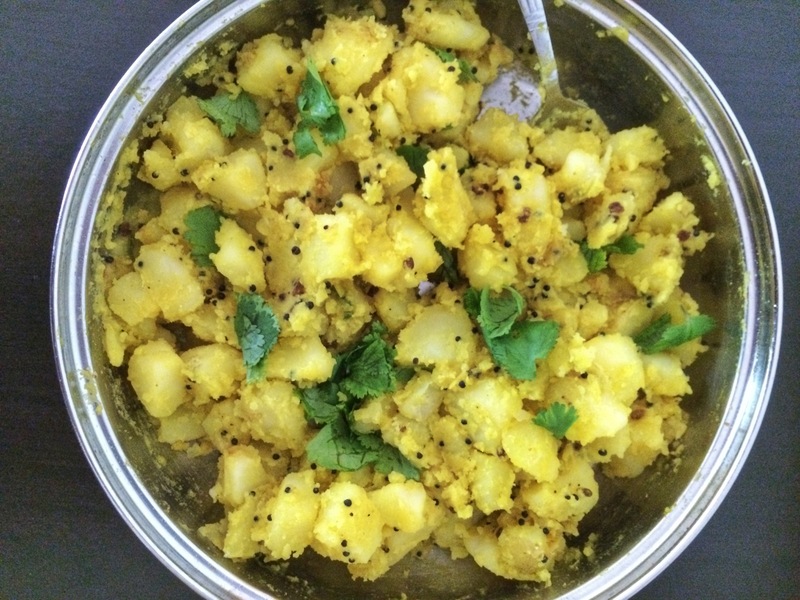 In a small pan, heat the clarified butter or oil with the mustard seeds. When the mustard seeds start to pop, pour the mixture into the pot with the tomatoes. 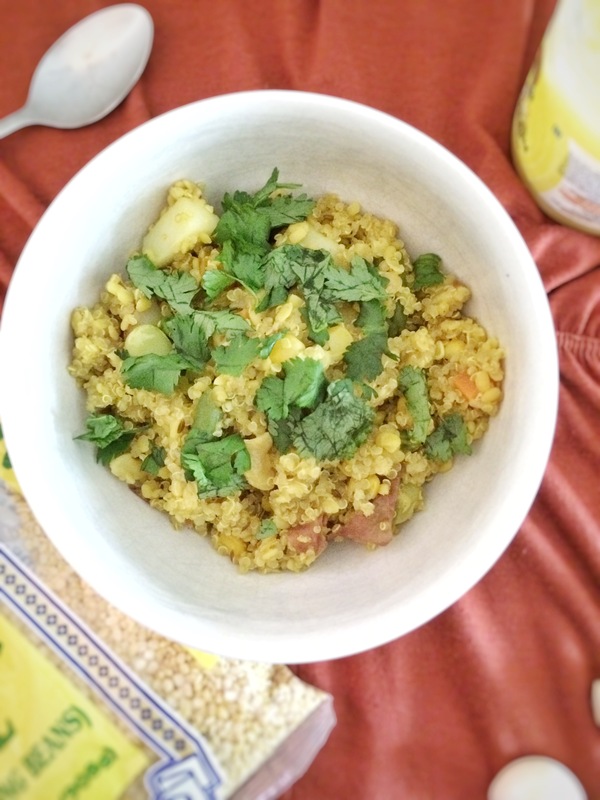 Garnish with chopped cilantro, and serve with brown rice or quinoa, or on its own like a soup. 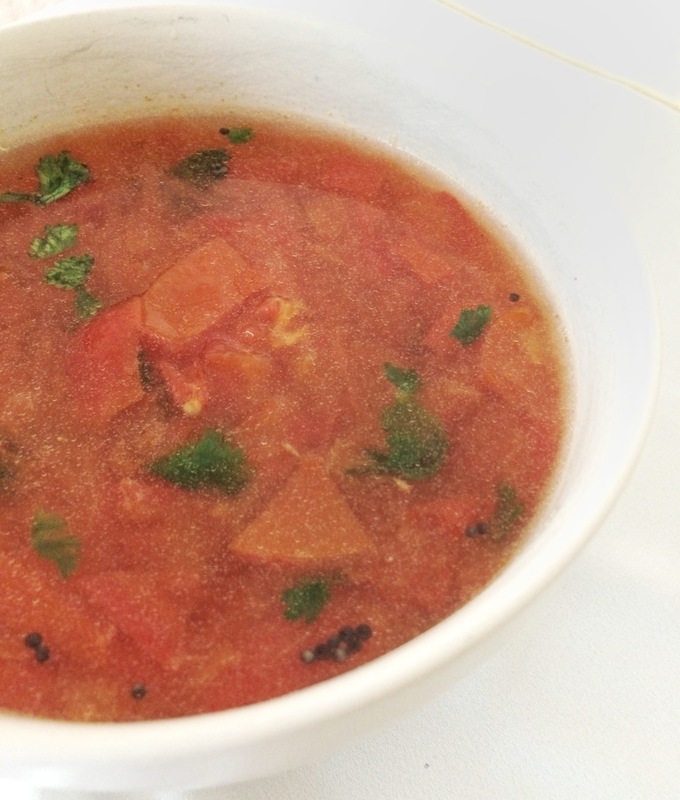 Next week’s recipe will feature a side dish that pairs perfectly with rasam! It has been a very eventful one! I co-hosted a ZUMBAthon and it was an incredibly sweaty two-hour long cardio session. It was amazing to see how many people supported us and the cause (cancer awareness). You would think that after two hours of Zumba, I would want a rest day the next day, right? Wrong. I went on a bike ride this morning, which was super fun and also super sweaty. After all of the cardio and sweat that has happened this weekend, all I have been craving is some fresh and healthy food, like salad, which I hardly ever crave! 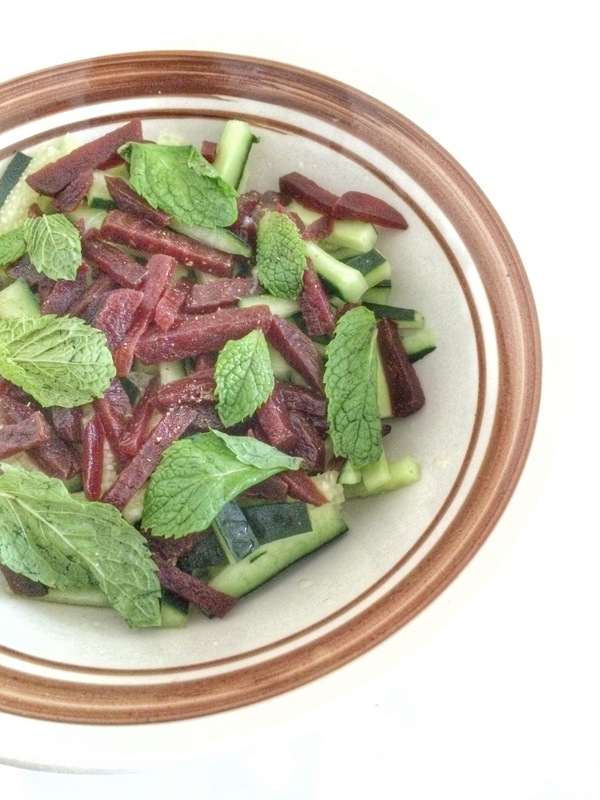 So I thought it was only fitting that I share with you this recipe for a cucumber beet salad. 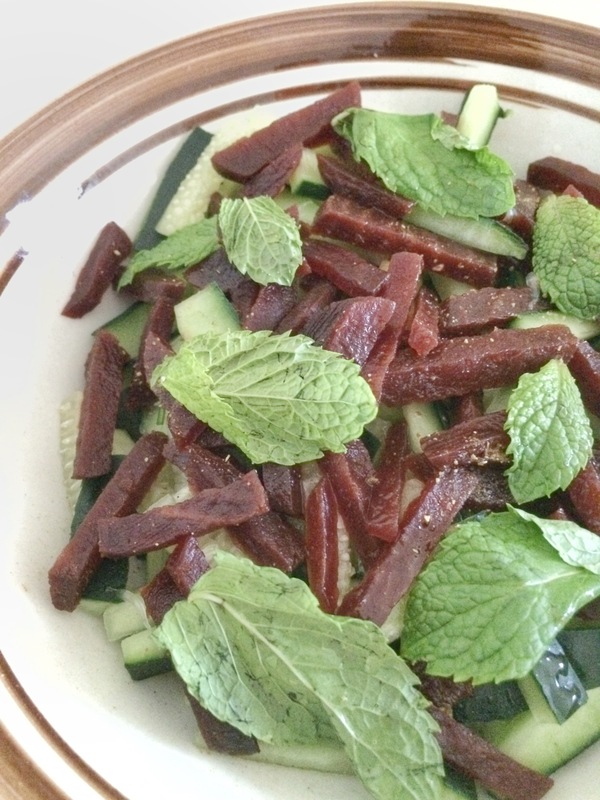 It is so refreshing, and is slightly sweet, slightly salty, and slightly spicy. A little bit of everything! Slice the cucumbers and beets into small pieces. Add to a large bowl with the mint leaves. Squeeze lemon juice, and add salt and chaat masala. Mix well and serve. 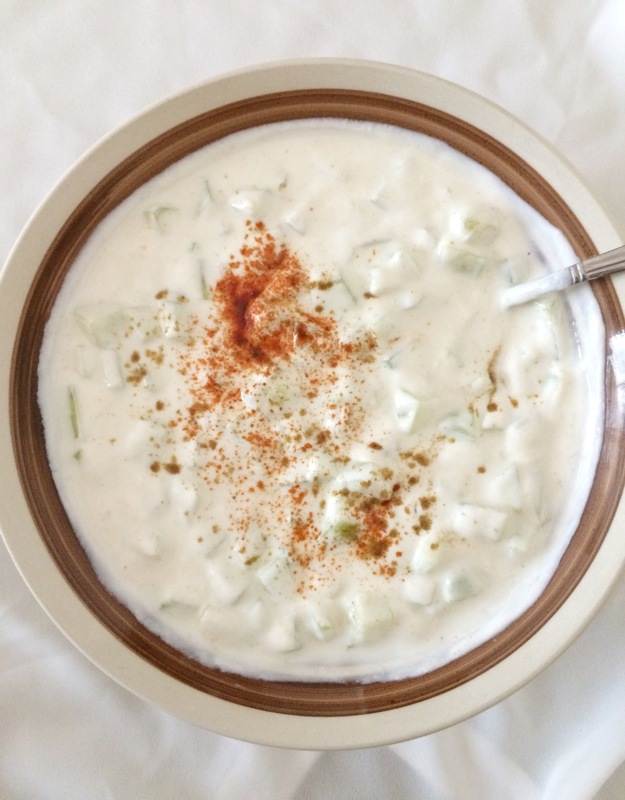 Thank you for all of your kind words and feedback on the cucumber raita recipe! I will definitely be posting more variations of the savory yogurt dishes in the future. But for today, I am switching gears to something completely different. I know that finding some of the spices for these recipes is a challenge, so hopefully this one should be a bit simpler! The key ingredient here is tandoori paste. You may be able to find this in the international section of your local grocery store. Of course, it is always available on Amazon if you aren’t able to find it in the grocery store. So… baked potatoes. I know that potatoes have a bad reputation. In fact, back in the days when I was anti-carbs (what was I thinking? ), I never ate potatoes. Luckily, I grew to realize that potatoes are not the enemy! They contain a good amount of nutrients, and how they are prepared makes a world of difference. Maybe this recipe will have you intrigued! Thaw the broccoli florets and proceed only when the florets are no longer frozen. (To expedite, place in the microwave to thaw). Mix 6 tbsp yogurt with 2 tbsp tandoori paste. Add the broccoli and stir to coat. Allow to marinate for 30 minutes. Rinse and scrub the potatoes. Dry with a paper towel. Place the potatoes onto a baking sheet. Brush olive oil onto the potatoes, and sprinkle with salt and pepper. Bake for 45 minutes to 1 hour. Remove the potatoes from the oven. Place the marinated broccoli onto a greased baking sheet. Cover with aluminum foil and place in the oven for 15 minutes. After the 15 minutes, remove the aluminum foil and bake for another 15 minutes. Remove the broccoli from the oven. Mix the sliced green onions into the remaining yogurt. Add salt and pepper as needed. Assemble the potatoes by slicing them in half. Place the broccoli into the potatoes, top with yogurt sauce and more tandoori paste for an additional kick! Hi friends! I spent the weekend on a mini vacation eating lots of gluten-free versions of the best foods (i.e. biscuits and gravy, pizza, crepes). Needless to say…carb overload. So happy. 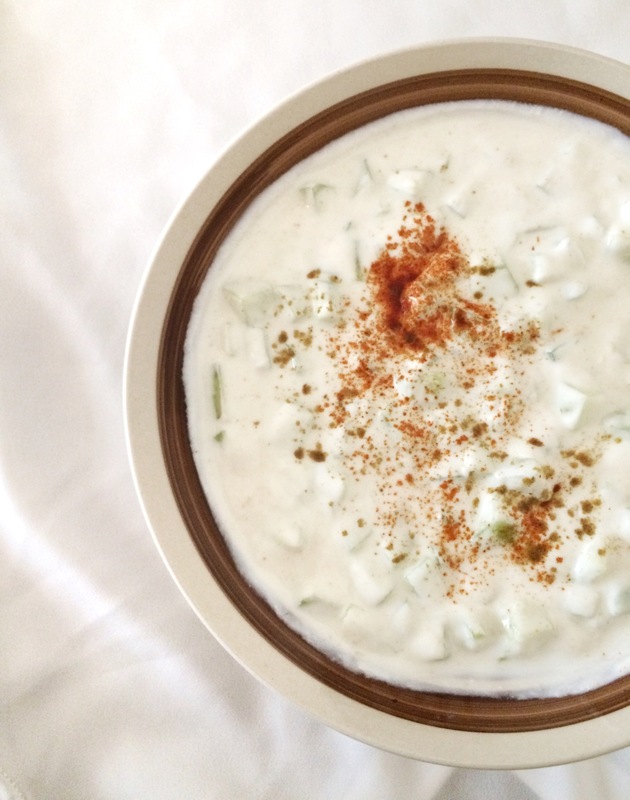 So I’m now going to switch gears and give you a super simple, super healthy recipe for a cucumber raita. 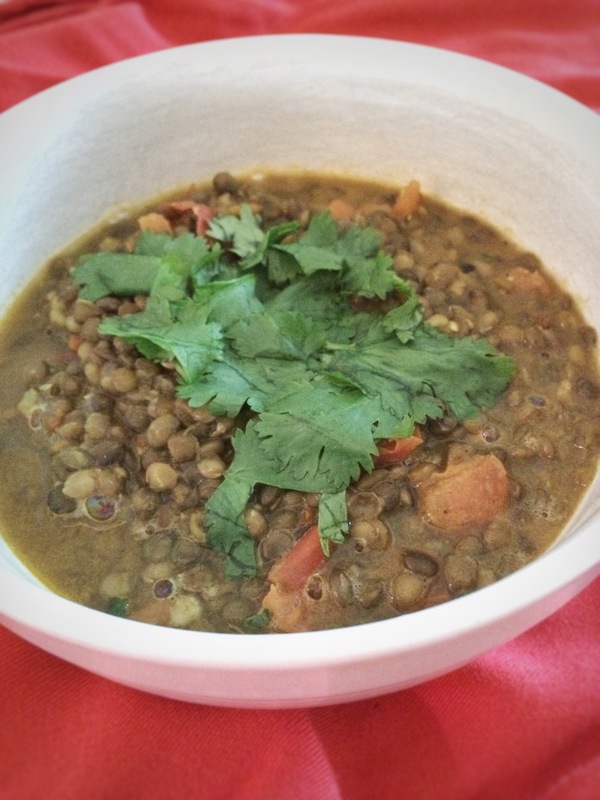 If you are new to Indian food – any form of Indian food goes well with a side of yogurt! Raita is a combination of yogurt, some kind of vegetable, and spices. This particular one is a cucumber raita, which is a very common version. If you are looking for a few ideas, this would go well with my quinoa upma, beet rice, or even the coconutty vegetable curry. In a large bowl, combine all ingredients. Refrigerate for 30 minutes to an hour prior to serving.